Amy and Raegen landed in Santa Barbara, just 3 days before their wedding. They had just flown 26 hours from Singapore (8,700 miles). They have never seen their wedding location and they have never met the company they hired to plan and design their dream wedding, in person before. That’s us- Magnolia Event Design. We have talked for the last 10 months over skype, text, email and g-chat, but we have never met in person. We have planned our first meeting much like you would plan a first date, what should we do? Breakfast? Okay, what time? What do you like to eat? How about an ocean view? I mean the back and forths go on and on. We are a decisive bunch, but there is, at least on our part the desire to make this first meeting, for lack of a better word, perfect. I pick the Boathouse. It goes from being 80 degrees to foggy that morning and I can’t find anything to wear and I am so excited and so nervous. I am not nervous in the will they like me stage? I got over that 10 months ago when Raegen asked me at the end of our first Skype, which was 6am California time and 11pm Singapore time if I was wearing a robe? For the record I had planned that outfit to look effortlessly chic, you know for 6am with full hair and makeup. It was a casual cashmere wrap sweater, so you can imagine how red I became when the groom asked at the end of the call if I was wearing a robe?!? Can I die now? For the last 1.5 hours, he has been thinking we paid her to wear a robe on Skype? I am both giddy and nervous. We have been calling it the second best blind date, ever. Second only to Amy and Raegen’s because they met on a blind date and are now getting married. It is one of many inside jokes that we have come to have over the last few months. We have built a friendship and we have gained our client’s trust from thousands of miles away- we have been eagerly waiting for this day to arrive and it is now here. The blind date went great, we took a selfie with my new selfie stick they gave me to document it. 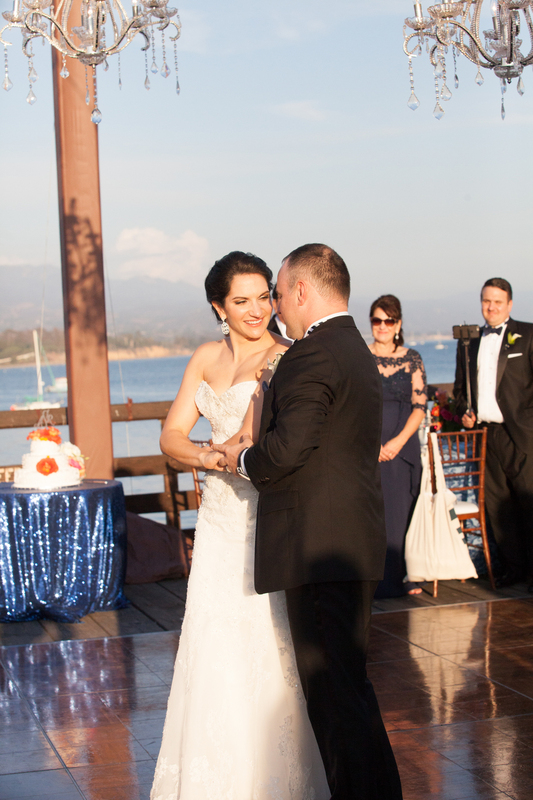 Until now we have planned and designed every portion of the wedding based on conversations and really listening to our clients tell us what is important to them and what they want their guests to feel and experience when they all travel to Santa Barbara from out of town. This is the first time we have planned without meeting our clients, but it isn’t something that happens everyday and given that our bride has a background in events and the groom’s family owned a resort there was just a little added pressure to make sure that everything was perfect for them. The bride an groom were married at Our Lady of Sorrows church by the groom’s family priest who flew in from his post at the Vatican- yes, you read that correctly. As a gift to the couple, Father Joe presented the couple with a papal blessing from the Pope. 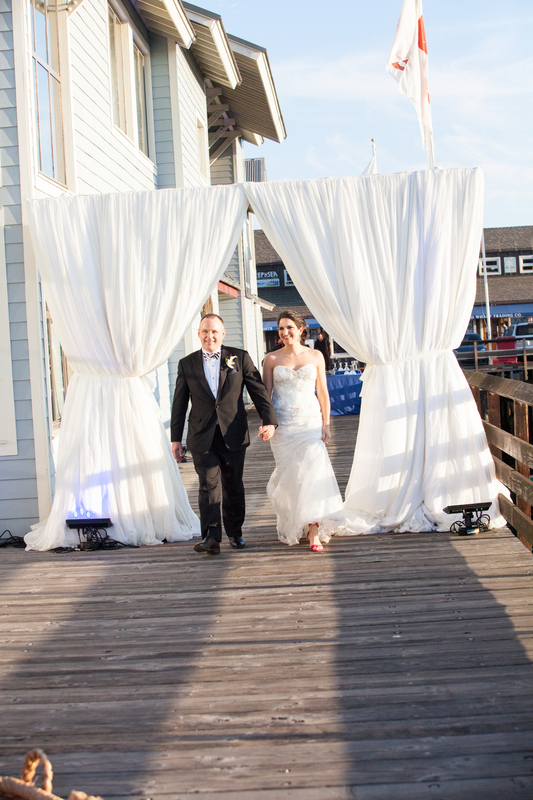 Following their wedding ceremony all guests boarded the Santa Barbara Trollies for a brief tour of Santa Barbara, which ended on the iconic Sterns Wharf. The trolley pulled onto the wharf and the guests were greeted by servers with glasses of local wine, specialty cocktails or local beer and then encouraged to pet sharks and explore the Santa Barbara Museum of Natural History Sea Center, which we had transformed for the cocktail hour. We didn’t know this when venue scouting, but Raegen loves aquariums. One day over Skype I said to Amy- I found your venue! She said, you did? Yes, I said. Do you want to know about it? I don’t remember exactly what she said, but she allowed me to tell her a bit about it and then she heard that there was a Sea Center associated with it and I wanted to hold the cocktail hour inside and she said that was perfect because Raegen loves aquariums and then she said that she didn’t want anyone to see it before the big day… It was so much fun watching guests drink wine, pet sharks, chat with longtime friends and learn about ecosystems. Interactive cocktail hours are so much fun! After cocktail hour we pulled back the white billowy curtains to reveal the dining space, which was created on a private finger of the pier. 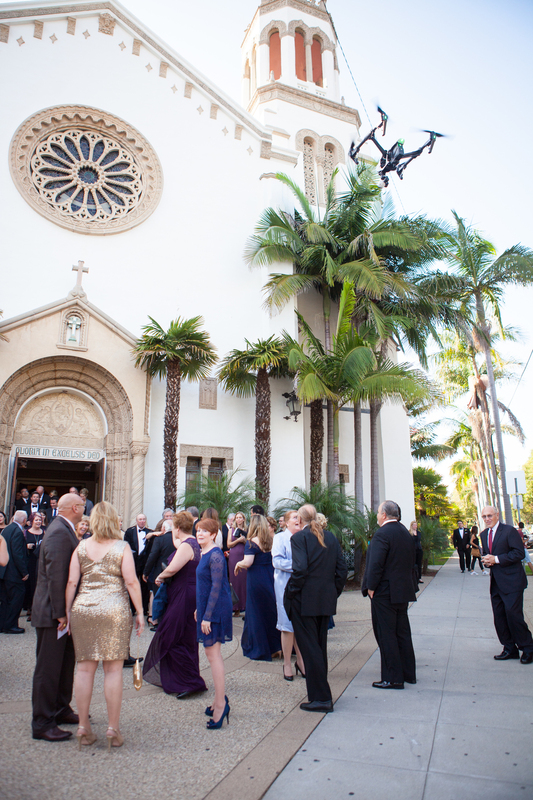 Guests were escorted to their table by custom leather luggage tags that have the coordinates of Santa Barbara embossed on them. Each table was named after an airport code that Amy and Raegen had visited together. The band began to play as guests found their seats. A monogramed napkin with the guest’s initials designated each seat. When the salad plate was pulled a handwritten note written by the bride and groom to each and every guests was revealed- just one of the many personal touches Amy and Raegen took extra time with to make sure their guests knew how much they meant to them. The bride and groom were announced as husband and wife and took to the dance floor under an open sky and chandeliers, one of Amy’s very few must have items for her wedding day. The evening progressed with toasts filled with love and tons of laughs- including bridesmaids in TOMS and oversized photos of the couple. There was the “gator pile”, a “Friends in Low Places” all out sing along with the band, The Selections and a Jack Daniels go pro… It was the most “refined fun” I have ever had the pleasure of being a part of and even better than that- the bride and groom were so pleased with everything we decided on for their big day. They loved the venue, they enjoyed the food, they danced all night to their band and they devoured the cake… I still email Amy each week, but miss our daily g-chats. As a planner and designer when you are trusted fully and completely by your client you want to do everything in your power to make sure they are happy and to make sure that you find the key things that are unique to them… I feel so fortunate to have client’s like Amy and Raegen who give the reigns over knowing they are the hands of a team who wants only the best for them and who wants to make the event perfect for them, no matter what. We couldn’t do this without the amazing team who is by our side the entire way, trusting in us just as much. It takes a village and we are grateful for ours.